Fantastic composed and capture also. Very romantic. This photo is a magnific colours. Great atmosphere. Beatiful conception. Regards and Congrats. Jan Iwo. Made a Favorite....a 7+++++...beautiful picture...!!! Stunning image and can see why it won the awards. Well composed. Beautifully framed picture. I love the reflection on the top blade of the windmill. Nicely done! oh! this is too good. i love it....congrats, abhra. Congrats for the deserved award. Congratulations, my dear friend Teunis, for the BIP. Well earned. Conggratulations, my dear friend Teunis, for the BIP. Well earned. Congratulations once again Teunis !! The silhouette is lovely and sharp, and I like the way the sky graduates from blue to red behind it - very nice. Van harte gefeliciteerd, Teunis met deze welverdiende BIP!!!! Wonderful silhouette and composition, my friend. Great light and colors, too. Congratulations for the awards. Very well deserved! Congrats on BIP. Beautiful sunset and silhouette! Congrats on another front page appearance, Teunis, with your Featured Donor Award! Teunis!...you're certainly racking up the awards with this series...Well done! Heel erg mooi en heel erg Nederlands. :) Good job. congratulations again dearest Teunis for making front page!!!!!!!!!! congrats for the front page my friend..
Goeden morgen Teunis wat zei ik toch tegen je dit is een plaatje om jaloers van te worden!! Wow stunning capture by you Teunis and many congrats well deserved !! A beautiful shot.. with stunning colours. gefeliciteerd met je award...je hebt um verdient met deze prachtige foto!!! Hi, dearTeunis! My congratulation on BIP!!! SUPERB! Best wishes! A.
ooo a superb image and a very well deserved award dear Teunis!!! congratulations!!!! Beautiful sunset and silhouettes, Teunis! Congratulations on the Award, also! Teunis, This is beautiful. Well framed and wonderful color. Don. WOW!! Teunis, what a fantastic shot! Excellent details and so beautiful colours... Congratulations!! You deserve the BIP!! work ,deserve it my dear . Congratulation on the BIP Teunis. I told you this was stunning. Superb!!! One of your best. Congratulations on the award. WOW, super sunset and silhouette!!! Beautiful colors, excellent composition.... love the natural framing... well captured!!! En weer een prachtige 'molen foto'... die boom/takken eromheen zijn fantastisch!!! Fantastic silhouette and backlight from the sun. Great Picture and congratulations Teunis !! Beutiful scenery.. romantic and warm! 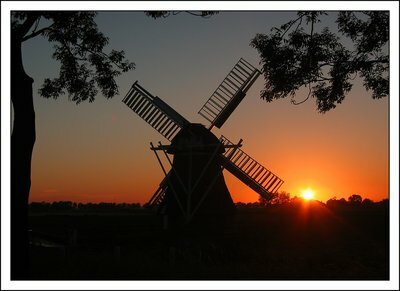 A wonderful silhouette of a lovely dutch windmill. The lighting, focus, and exposure are spot on. The foreground foliage is a nice touch. really great capture of the colors Teunis. Teunis Gorgeous sunset around the mill. Nice framing with the silhouettes of the branches/leaves. Teunis this is going to the top of my list this is a magnificent image. Hoe bent u vandaag mijn vriend? Super capture Teunis, a bip for sure! How are you? Haven't 'seen' you for awhile.